LMAC Photography absolutely loves to photograph bridal parties. We're crazy about brides and grooms who allow us the leeway to be creative with the bridal party photos and have fun. This bride and groom had selected the Lock 3 area in downtown Akron to have their bridal party and bride and groom photos created. Lock 3 is a popular location in downtown Akron and LMAC Photography photographs many different sessions at Lock 3. The best element of Lock 3 is its edgy and urban feel. 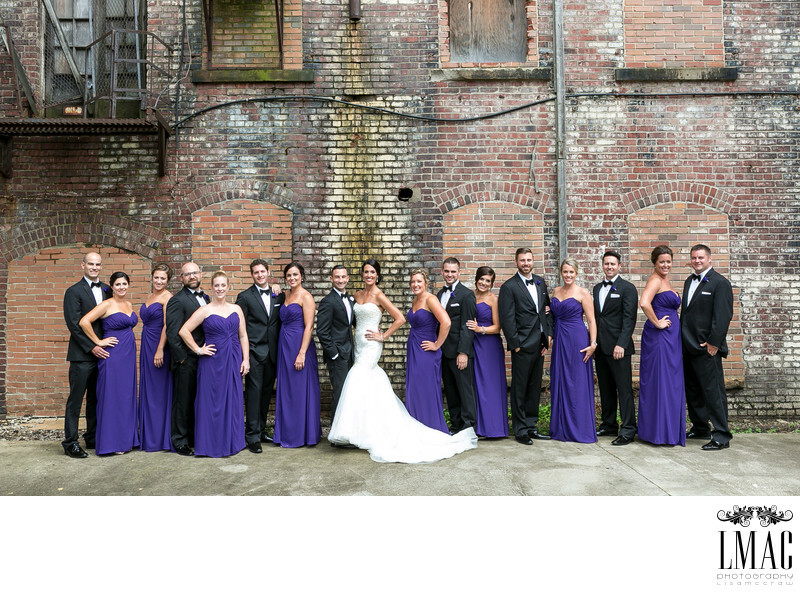 This brick wall was the perfect compliment to these vibrant purple bridesmaids dresses. this bride and groom also conducted their ceremony at St. Anthony's in downtown Akron whereas the reception was held at Greystone Hall; a spectacular downtown Akron venue known for it's absolutely gorgeous ballroom.